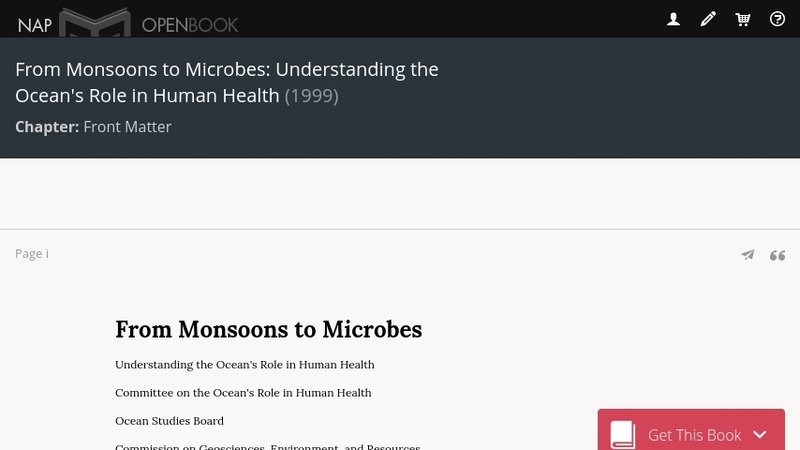 This online book offers a deeper look into the oceans that surround us, exploring the links among physical oceanography, public health, epidemiology, marine biology, and medicine in understanding what the ocean has to offer. Chapters include: contains chapters about climate and weather, coastal hazards, and public health; oceans and infectious diseases, harmful algal blooms (HABs); marine-derived pharmaceuticals and related bioactive agents; and marine organisms as models for biomedical research. PDF versions of the chapters are available to skim or read.